Fox News and owner Rupert Murdoch's newspapers The New York Post, and The Wall Street Journal have all fallen silent as more questions emerge about Bill O'Reilly's claims about his reporting career. The New York Post has never reported on any of the recent revelations that O'Reilly has inflated tales of his journalism career, while the Wall Street Journal provided just one article right as the controversy began, and Fox News' scant coverage has disappeared as they now ignore all new developments, according to a Media Matters review. O'Reilly has come under heavy criticism for multiple lies and exaggerations, after a Mother Jones report first noted the Fox host has a history of misleadingly claiming to have been "in the Falklands" and in "combat" during the Falklands War. Media Matters has also identified serious discrepancies in O'Reilly's stories about witnessing nuns being shot in El Salvador, and overhearing the suicide of a figure linked to President John F. Kennedy's assassination. When the original Mother Jones piece broke, Murdoch's Fox News went to war with the magazine. O'Reilly immediately gave a series of interviews to other news outlets, denying the allegations by saying he had never said he was on the Falkland Islands themselves, and launching personal attacks. On Fox News itself, O'Reilly first lashed out at critics during his February 20 show and dismissed the Mother Jones report as "garbage," and later used his February 24 show to try to shift the focus away from the scrutiny. Fox's MediaBuzz also covered the story, giving O'Reilly another platform to attack his critics. No other Fox News program covered the story, according to a search of the Nexis and Snaptream databases. The Wall Street Journal, which is also owned by Murdoch, similarly reported on O'Reilly's initial denials. 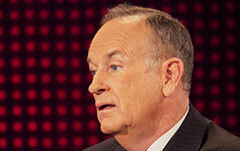 When Media Matters further reported on February 25 that O'Reilly had fabricated the claim that he personally "saw nuns get shot in the back of the head" in El Salvador, O'Reilly also offered a statement to Mediaite claiming that when he said "I was in El Salvador and I saw nuns get shot in the back of the head" he was referring to seeing "horrendous images" of nuns murdered, not personally witnessing their deaths. He did not, however, mention the El Salvador controversy that night on his show, and Fox's PR department released a statement the same day suggesting they would not continue to respond to the "accusation du jour." Additionally, neither Fox nor O'Reilly have directly addressed Media Matters' report on the substantial evidence undermining O'Reilly's claim that he "heard" a shotgun blast when a figure linked to the assassination of President John F. Kennedy committed suicide. Outside of O'Reilly's own program, no Fox News show has even hinted at these developments, according to a search of the Nexis and Snaptream databases. Similarly, other Rupert Murdoch-owned media properties have fallen silent or failed to mention the controversies entirely. Though the Wall Street Journal reported on February 20 on O'Reilly's initial denials of the Falklands story, the paper hasn't mentioned O'Reilly since. According to a search of the newspaper's website and Factiva, the paper has not reported any of the new developments. And The New York Post hasn't published any stories about O'Reilly this month, except for a brief mention in an Inside Edition anniversary special piece. The evidence of O'Reilly fabricating and exaggerating past experiences has sparked national news coverage in other non-Murdoch outlets, including CNN, MSNBC, Politico, The Washington Post, The Daily Beast, The Huffington Post, and more. Previously, Murdoch-owned properties have not shied away from reporting on O'Reilly controversies. For example, the New York Post published multiple reports in 2004 on the alleged $60 million dollar settlement over an O'Reilly a sexual harassment lawsuit filed by Andrea Makris, a former O'Reilly producer. Tell Fox News to hold O'Reilly accountable for deceiving viewers about his "combat zone" experience.